This section traces the beginnings of the Sans Pareil and its proprietor John Scott. His daughter’s musical and dramatic talent convinced him he should build her a theatre. The first map is redrawn from one of Richard Horwood’s Maps of London, published between 1792 and 1799. It shows 411 The Strand and the buildings behind, which were to become the Sans Pareil Theatre. The second map is from Christopher and John Greenwood’s Map of London, 1830. The theatre, now called the Adelphi, is colored blue. The final redrawing is from Edward Stanford’s Library Map of London and its Suburbs, 1862. This Adelphi is the house Ben Webster rebuilt in 1858. Redrawn from Edward Stanford's Library Map of London & Its Suburbs was first published in 1862. The redrawn image was rotated–-technically north is about 2 o'clock. See the Compass in the upper left hand corner of each map. The map from 1799 is very detailed even giving the street address. The detail seems to be reduced in the later maps, where individual buildings are no longer indicated. This map segment is redrawn from Richard Horwood's Map of London, completed in 1799; publication dates from 1792 to 1799. John Scott (c. 1742-1838), who built the Sans Pareil Theatre, had his shop and residence at 419 Strand from 1782-1787. He moved to 417 Strand in 1787. In 1804, Scott bought the leases to the 11 buildings surrounding Bayley's Alley behind 411 Strand. He converted the buildings to a theatre for his daughter, Jane, which opened in 1806 as the Sans Pareil Theatre. In later maps, there is no Bailey's Alley, and the surrounding 11 buildings have become the Theatre. Over the years, 409 & 410 Strand became part of the Adelphi, as did 18, 19, & 20 Maiden Lane. Bayley's Alley no longer exists. 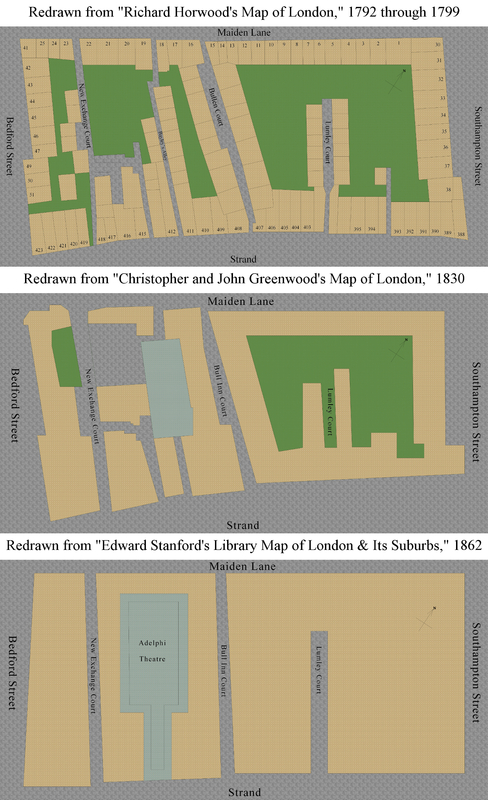 This map segment is redrawn from Edward Stanford's Library Map of London & Its Suburbs, was first published in 1862. This map clearly shows the Adelphi with the entrance on the Strand. The north end of what was Bayley's Alley no longer shows. The north end of the Adelphi does not extend to Maiden Lane. As the century progressed, proprietors did gain ownership of No 18, 19, and 20 Maiden Lane. The Builder, in 1858, shows that there is an entrance on Maiden Lane, but this map does not seem to indicate it.